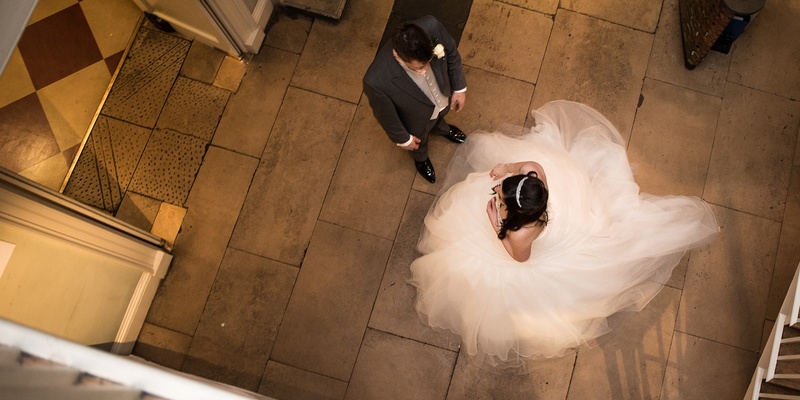 Pelham House is being imaginatively transformed and will be in full swing for the 2019 wedding season. In the meantime, we’d love to share with you our vision for this private 16th-century wedding venue in the heart of charming Lewes, East Sussex. Soon, this historic building reborn can be exclusively yours. Enter through the front door and you’ll be immediately enveloped in luxury – it’s hard to miss the sweeping staircase and romantic Trompe L’oeil mural on the ceiling above. Continue to The Goring ceremony room, which can be filled with flowers and gauzy drapes for your ‘I do’ and then onto the sophisticated Garden Room and Bar, all lit up with feature lighting and filled with chic seating. The Blencowe dining room is a fine example of how heritage details and modern finesse come together at Pelham House. You’ll fall head over heels for the contemporary colour palette, grand pillars and wood-panelled walls, and there’s loads of room for a band and dancing, making it ideal for your reception. Convenient yet tranquil, you will enjoy the best of both worlds at our private Georgian house. All your friends and family can be there thanks to its town-centre location right by the train station, while the peaceful landscaped gardens and clifftop views will make you feel like you’re a million miles away. We have a wealth of impeccably finished guest rooms for your nearest and dearest to extend the celebrations in, and for you, the luxurious and spacious Pelham Suite complete with cosy sofas, a huge bed and standing bath, awaits.